Jane Alexander Stewart is a clinical psychologist who writes about mythic themes in film. Her website, Cinema Shrink, contains archives of her reviews and she currently writes a monthly film review for Newtopia Magazine. Remember HAL 9000, the sentient computer in 2001: A SPACE ODYSSEY (1968) who surprised his makers with his ability to read their lips? Well, Spike Jonze’s HER (2013) goes way beyond HAL. 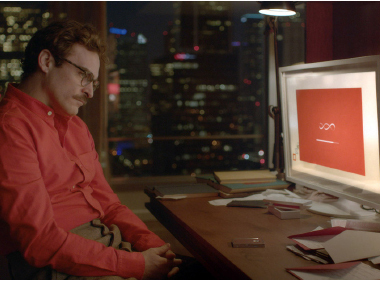 HER explores a love relationship between a computer operating system (OS), aka Samantha (portrayed by a voice-activated Scarlett Johannson), and a lonely guy, Theodore Twombly (Joaquin Phoenix), who is mid-stride a failed marriage about to end in divorce. The two have mesmerizing exchanges via Theodore’s phone earpiece. Curiosity about the potential of artificial intelligence to take on human qualities — conversational and emotional behaviors — has long fed the imaginations of writers and filmmakers. "R.U.R." (a science play from 1920), was my first introduction to the intriguing idea of robots as humans, raising the question of whether robots could feel — and possibly fall in love. But what caught my attention in HER was the unusual opportunity Spike Jonze created for me to imagine what human beings may be like once we’ve played in the field of cyberspace for a few hundred, or few thousand years. Samantha doesn’t just think, feel, sense emotions and talk empathetically. She’s more than a perfected cyber mate. She evolves and she facilitates the emotional evolution of Theodore as well. Never mind that she is, presumably, from the other side of a reality divide. Once a man who could only write anonymous letters about love, Theodore eventually writes a soulful letter to his ex-wife and reaches out romantically to a woman he likes, Amy (Amy Adams), who lives down the hall from him. Amy has also developed a relationship with her own OS. Theodore is now revamped and ready for a relationship. Samantha’s reprised, a woman albeit body-less but with dreams of a future all her own. I’m a relative latecomer to the magnificent obsession of relating to an entity that Ralph Waldo Emerson might’ve called an “Over-soul” and E. L. Doctorow calls an “overbrain.” I’m still amazed when I barely have to think that I want to buy a frying pan and I’m offered a list of options via the magician who hoards cookies on my computer. And now I find myself contemplating a lifechanging question. Is the OS created for my computer creating me as I reveal desires and make choices? HER ends on the roof of the Disney Concert Hall looking out over L.A. where digitally enhanced lights twinkle in the night. Is the Hollywood dream machine winking at me, suggesting I let my imagination go wild?